In this holiday season, people are joyfully celebrating a year harvest and expressing their hope of the new year. In the afternoon of December 29, Asian Pacific Art Institute of America (APAIA) is holding a philanthropic auction party. The Beiwei drawing class of the APAIA successfully held the party named "Compassion Offer - APAIA Teacher and student Drawing Work Charity”. This charity activity has generated $1446 US and the money will contribute by APAIA to Elizabeth Glaser Pediatric AIDS Foundation, to help special youth who have urgent needs. This charity activity is initiated and organized by Fu Lanxing, a 15 year-old high-school pupil in Beiwei drawing class of APAIA and was greatly supported by students in the drawing class and their parents. The president of APAIA, renowned painter Mr. Mu Jiashan also gave the activity full affirmation and support. The students started to prepare their artwork from October. In the auction party, each of their work, from 5 year old of young student's lovable cartoon drawing to 17 year old student's enjoyable traditional Chinese paintings, showed their best effort, accompanied with their love. Each students have all offered up own best work. Their love moved and infected everyone who came to visit. Mr. Mu Jiashan has presided over the beginning ceremony, he gave the full affirmation to students who participated the activity. In order to expresse his support, Mr. Mu Jiashan extemporaneously performed painting on the scene. The adept technique, the deep skill, the command of Mr. Mu has impressed all guests. Afterwards, Mr. Mu has presided over the charity party. He gave each student’s work just right explanation, pushes to the charity party from one high tide to another. Some students’ works passed through above 6 times for auction. Three paintings Mr. Mu did on the scene were each pass through above 10 times and sold for more than $1000. 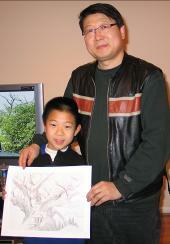 His eight year-old son put out his own new year's money and purchased an artwork by a student, offers up his compassion. Finally, charity auction concluded in warm and cheerful atmosphere. President Mu indicated that, this activity has extremely significance, it provided for all participating students mutually to learn from each other. Some students bought their schoolmate's work. From this activity, the students realized that their own work can make the contribution to the whole society, their compassion might help those unfortunate contemporaries. 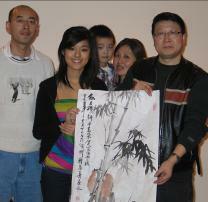 The event initiator Fu Lanxing and her family bid a painting by Mr. Mu.